October 24, 2018 /in Blog, Lyft Drivers, Driver Advice /by Don M.
How Does The Lyft Driver Bonus Work? How Much Will My Lyft Bonus Be? How Much Can I Make Driving For Lyft? Lyft has exploded in popularity over the past year, adding millions of new passengers. However, this means Lyft desperately needs drivers. Use a Lyft driver promo code when you sign up, and you could get a Lyft driver bonus of up to $800, or an earnings guarantee bonus of $4400. Current Lyft driver bonus amounts range from $10 to $800. This bonus is in addition to your regular Lyft driver earnings. However, in most cities, Lyft has moved away from cash sign up bonuses and towards earnings guarantees. Current Lyft driver guarantee amounts go up to $4400. However, the $4400 Lyft bonus guarantee is only available in a few cities (San Francisco). Be aware that the $4400 Lyft offer is an earnings guarantee, not a sign up bonus. Basically, Lyft guarantees you’ll make $4400 (gross pay, before Lyft takes their cut) if you do a certain number of rides in your first four weeks. If you do that, but don’t make $4400, Lyft will pay you the difference. Using a Lyft driver promo code is pretty simple. Just click the button below to start your application with a Lyft promo code. Or, you can visit the Lyft Website, and follow the steps below to enter a Lyft driver code manually. 1. Enter your cell phone number on the first screen. Then, click “Apply To Drive”. Pretty easy either way, right? That’s all you have to do to start your application, and lock in your bonus amount. 3. Choose to use your own vehicle or rent a vehicle through Lyft. 4. Fill in your driver information. 5. Give consent to Lyft to run a background check. 6. Upload your insurance, license, and other required info. Document requirements vary by market. Usually, you need your registration, license, and proof of insurance. But check your specific market requirements here. How Much Do Lyft Drivers Make In 2019? After that, you just have to wait for approval. You must have had a license for at least one year. You must have a relatively clean driving record. If you don’t meet all the requirements above, you may still qualify to drive for Doordash or Uber Delivery (Uber Eats). In most markets, a 2004 or newer model year car will qualify for Lyft. The car must have 4 doors and at least 5 seatbelts. In certain markets, you’ll need a newer vehicle. Also, if you want to drive Lyft Lux, you’ll need a 2012 or newer qualifying vehicle. See the Lyft vehicle requirements page for information for you specific market. As long as you use a Lyft driver promo code when you sign up, you’ll get a Lyft sign up bonus or earnings guarantee. However, you must be sure to enter a code when you begin your application. The Lyft sign up bonus is per ride. Here’s how it works. Say you sign up for Lyft in Los Angeles and you get a $800 sign up bonus, for giving 400 rides in your first 60 days. So, you get a bonus of $2 on each ride you give. Because the bonus is per ride, if you give 200 rides in 60 days, you still get a $400 sign up bonus. Even better, you get paid part of your bonus each week. You don’t have to wait 60 days to get the bonus! If you give 40 rides in your first week, you’ll get an $80 bonus. That’s on top of your regular Lyft driver earnings. It depends where you are located. Your Lyft sign up bonus is determined by where you’ll be driving. The highest Lyft driver sign up bonus is currently $800 and the highest Lyft earnings guarantee is $4400. Sign up bonuses are only available in a few cities. In most cities, Lyft has switched to a sign up earnings guarantee. In cities where Lyft still offers a bonus, the amount is between $300 and $700. To see recent Lyft bonus amount near you, check out our list of Lyft bonuses by city. There are a number of sites out there promising $4000, or even $5000, sign up bonuses. Unfortunately, there’s no such thing. If the amount is over $800, it’s a Lyft guarantee, not a sign up bonuses. So, if you see sites promising giant bonuses like that, you can be sure they are fake. Has The Lyft Driver Bonus Changed? Yes, it used to be a lump sum bonus instead of per ride. A new Lyft driver would be required to complete a certain number of rides. After the driver completed the rides, they would receive their Lyft bonus. Now, the driver receives their Lyft bonus as they complete each ride, not after completing all the rides. Once upon a time, there actually was a $5000 Lyft sign up bonus. It was in Los Angeles. The ride requirements were insane, something like 2000 rides in three months. But, if you were able to complete all the rides, you would get a $5000 bonus, on top of your regular Lyft earnings. It depends. Nationally, Lyft drivers earn around $17 – $18 per hour. However, Lyft drivers in cities with more than 500,000 people can earn more. Drivers who have a car that qualifies for Lyft Lux or Lyft XL earn the most. Experienced Lyft drivers in many cities can earn up to $25 per hour during peak hours. If you have a vehicle that qualifies for Lyft XL or Lyft Lux, you can earn $30 per hour or more. When you first start to drive for Lyft, a realistic expectation is around $15 – 16 per hour. As you drive more, your earnings will go up. Pretty much every Lyft driver earns more in their second and third weeks driving, than in their first. If you drive for Lyft, you can also increase your earnings through various bonuses and incentives. With Lyft streak bonuses and earnings guarantee promotions, drivers can add hundreds to their weekly pay. It’s actually pretty routine most of the time. You pick people up, take them where they are going, and you get paid. You meet some interesting folks and have some good conversations. Also, you learn your way around very well. You also wind up becoming a better driver. After all, you’re driving more, and practice makes perfect. Once you’re approved, you’ll receive your own Lyft driver referral code. Think of this as your own Lyft driver promo code. You can give your Lyft driver referral code to friends or family. You can also post your code on your social media accounts. Some drivers even have Lyft promo code business cards made. You can refer new riders and drivers. When they sign up, they can get free Lyft rides or a Lyft driver bonus. And as the referrer, you could get a Lyft driver referral bonus. Can I use two Lyft driver promo codes? Nope, you can only use one code. Also, you can give no more than one ride to the same person for the bonu requirements. Nationally, Lyft drivers earn about $2 more per hour than Uber drivers. But earnings vary from market to market. Can you drive Lyft with a friend or family member in the car? No, you will definitely be deactivated. How long does it take to get approved by Lyft? It can take from one day to several weeks. Most people are approved to drive for Lyft in 5-10 days. What day of the week does Lyft pay its drivers? Lyft sends payments out every Tuesday. At most banks, the money is in the account by Wednesday. Can I be paid instantly on Lyft? Yes, Lyft has instant pay. You can cash out your earnings at any time during the week. After cashing out, the money usually arrives in your bank account in a few minutes. 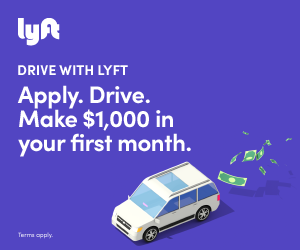 So, if you’re looking to make over a $1000 per week, or up to $20 – $25 per hour part-time, get started on your Lyft application today!